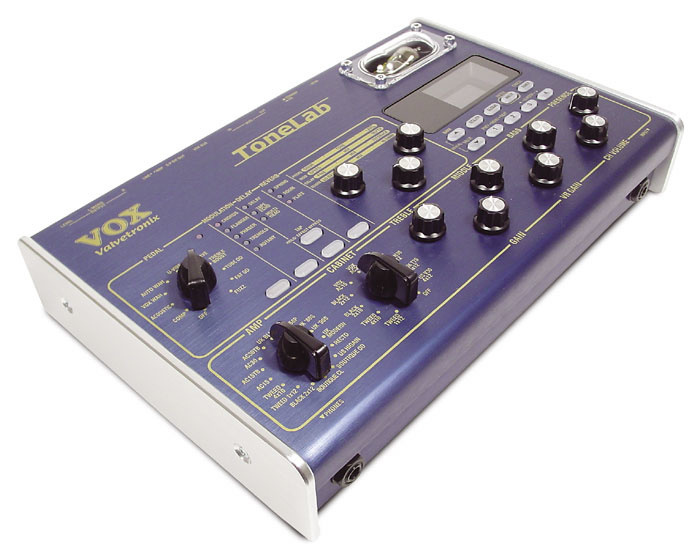 The Vox Valvetronix Tone Lab is a spin-off from Vox's AD60/120VT modelling amplifiers, which take the approach of combining digital modelling and signal processing with both solid-state and analogue amplification stages, rather than trying to emulate absolutely everything digitally. Conceptually, the Valvetronix Tone Lab fits into the same camp as products like the Line 6 Pod (amp/speaker modelling plus effects) and can be used either for DI recording or to feed an amplifier for live performance. However, whereas the Pod takes the all-digital approach, the Tone Lab includes a miniature power-amp stage based around a 12AX7/ECC83 dual-triode tube, where some clever 'pseudo-transformer' circuitry has been used to make this influence the sound much as a real power stage would. Such innovative technology has to be given a fancy name, and in this case it is the Vox Valve Reactor. A built-in valve gain stage adds extra realism to many of the amp models.Much of the effort has gone into recreating the effect of an output transformer without actually having one, an important factor given that the output transformer and the way it interacts with the loudspeaker load forms a crucial part of the tube-amp sound. The Presence control on those amps that feature one also relies on the output transformer — rather than simply being EQ as you might imagine, Presence controls adjust the amount of negative feedback in the power amp section from the output side of the transformer, which means that the effect is actually quite complex. 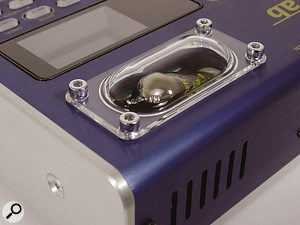 Furthermore, this miniature power stage automatically switches between Class A and Class AB depending on the amp model selected, and the output tubes of the original amp are shown in the display window for whatever model is active. Vox AC15s and AC30s used Class-A circuits, whereas the majority of Marshall and Fender designs, other than very low-power models such as the Fender Champ, have Class-AB push-pull output stages. Not only does the correct choice of power amp characteristic affect the sound, but it also changes the way the guitar feels to the player, which is a vitally important element of any guitar amplification system, and one that probably makes no sense at all to keyboard players! A rear-panel slide switch selects between Amp and Line, where the Amp output is voiced for use with a guitar amplifier (seemingly with quite a lot of top cut to compensate for the top boost added within most guitar amps) and Line is designed for DI recording. The unit may also be used in mono by connecting only the left output. Preceding the mini tube power stage is a digital modelling system that provides amp modelling, speaker modelling, stomp-box modelling and a post-amp effect section where the user can add modulation, delay and reverb at the same time. Unlike the Line 6 approach, there is no dedicated mic modelling stage. There are five types of modulation effect to choose from, three delay types, and three types of reverb, all with simple pedal-style editing via three front-panel knobs. In the pedal section are ten effects, comprising Compressor, Acoustic Emulation, Vox Wah, Auto Wah, U-Vibe, Octave, Treble Boost, Tube OD, Fat OD and Fuzz, again all editable via the same three knobs. The unit also has an integrated noise gate that can be set differently for each patch, and a built-in chromatic guitar tuner. The Tone Lab has the usual stereo analogue outs on balanced jacks, but also offers a digital output via optical S/PDIF, plus MIDI In and Out jacks for patch dumping or parameter editing using the free (but PC-only) Sound Editor software. The digital signal at both the input and output converters is at 20-bit resolution and has a sampling rate of 44.1kHz. A network-style socket labelled Vox Bus is used to connect an optional floor controller that simplifies patch changing in live performance as well as giving access to the tap tempo feature, the tuner and two pedals for controlling volume and wah. Note that the tuner's reference 'A' can be recalibrated between 438Hz and 445Hz. In contrast with the flowing lines of the Pod, the Tone Lab is presented in a businesslike metal case with Vox-style chicken-head knobs, traditional amp controls, and a small perspex bulge to protect (and at the same time show off) the tube. A plasma display looks after patch names (up to eight characters) and numbers as well as monitoring parameter editing, and in all there are 96 program memories (arranged as 24 banks of four) of which 48 are presets and the remaining 48 are for user patches. The amp, cabinet and pedal types are selected using dedicated stepped switches, and the various sections are clearly marked for ease of use. In fact, although there's an excellent manual with the Tone Lab, most people who have used a programmable processor before should be able to find their way around it with no trouble. Nevertheless, it's still worth reading through the manual, if only to find out what all the spare knobs do when you select an amp model that featured fewer controls than the Tone Lab. A stereo headphones connector is located conveniently on the front edge of the unit.In addition to the selector switches, there are seven rotary amp controls for Treble, MIddle, Bass, Presence, Gain, VR Gain (the gain from the preamp stage into the power amp section) and Channel Volume. Other than that, there are just ten buttons beneath the display, four of which are used to select one of the four presets in the current bank, and two of which are used to step up and down through the banks. The remaining keys relate to the Utility and Global setup modes, patch writing, and calling up the tuner. There are three more knobs in the pedal/effect section, and five buttons for selecting effects and for determining which section the three edit knobs currently refer to. 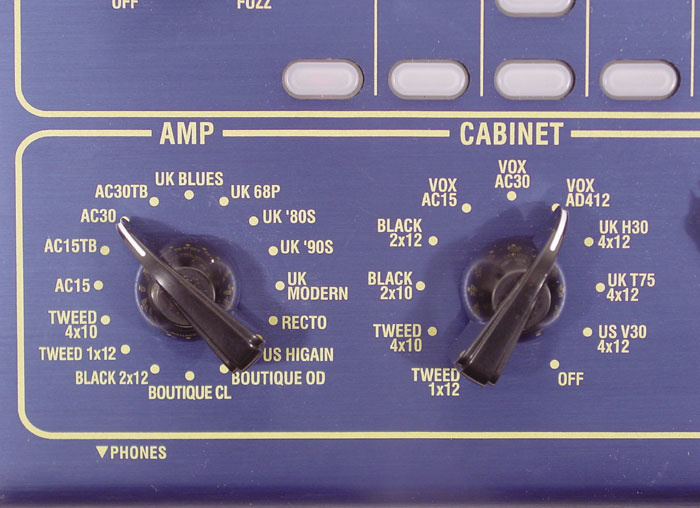 All the post-amp effect types are screened onto the panel, with status LEDs alongside, so the selection buttons are used simply to step through them. Again, all the parameter functions for the various sections are screened above the knobs, so there should be no cause for confusion. The designers have gone to great lengths to model good examples of their favourite amps, but although the origins of these amps are hinted at fairly strongly, no brand names are mentioned other than of course Vox. Terms like Tweed, Black, UK68P, UK '80s, UK '90s and UK Modern leave you in little doubt, as do Recto and US High Gain, though for the Boutique models you have to guess which ones they went for. 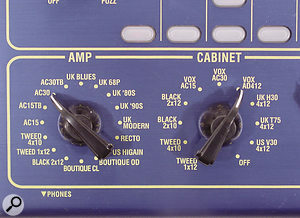 The operation of the tone controls of the original amps has been modelled, and in instances where they didn't have as many controls as the Tone Lab, the extra knobs should normally be left in their 12 'o' clock position for the most authentic tone, though they are still active to allow extra leeway beyond what the original amplifier offered. Similarly, not all amplifiers had Presence controls, so where one was not fitted, the Presence knob has been used to control another parameter that the designers felt was important. For example, Vox amps had no Presence controls, so the knob is used as a top-cut control instead. The Valvetronix Tone Lab lets you choose from 16 amps and 11 cabs, directly from the front-panel chicken-head rotary switches.To go alongside these 16 amp models are 10 simulated speakers, which of course you can switch around if you want to try a British amp with a particular US cab. Part of the modelling of the speakers is tied into the way they react with the amplifier output stage, so the feel and tonality changes depending on playing intensity. There's also an off position that bypasses the speaker emulator. The previously listed pedal effects are mainly self-explanatory, though it's worth mentioning the Acoustic Simulator option, which goes some way towards making an electric guitar sound like an acoustic guitar fitted with a pickup system. I probably wouldn't record with it, but it might get you by at a gig. In this mode the three controls adjust the bass, body resonance and treble of the modelled sound. Wah is modelled on the original Vox V847 wah pedal and, although you can sweep it using the edit controls, you really need the optional floor controller or a MIDI pedal to use it properly. The challenge is to do it without moving your mouth as you play! Alternatively there's an Auto Wah setting that responds to picking intensity, but it's not as much fun as that pedal. The Octave setting is an octave divider which, just like one of the original units, only works with single notes, and you can dial in one or two octaves below the original signal. U-Vibe is based on the Univibe phase/vibrato pedal favoured by Jimi Hendrix. Treble Boost is modelled on the AC30 top boost circuit, while the Tube OD overdrive admits only that its role model is a sickly green colour! The remaining three effects sections come after the amp-modelling stages, and may be used simultaneously. Although these are not radically out of the ordinary, the delay stage does offer a choice of pristine digital delay, simulated tape echo (which is warmer-sounding and less distinct) or multi-head echo with a choice of five 'head' combinations for rhythmic repeats. Very nice! Both chorus and flanging are available in the Modulation section, where the Flanger seems to have the same features as the original Electro Harmonix Electric Mistress, including the manual or 'parked' flange option. Tremolo, also found in the Modulation section along with Phaser and Rotary, has a width control to allow stereo panning, and takes after a black 2x12 combo of US provenance, while the phaser claims to have been influenced by something analogue in a yellow box! There's also a decent rotary-speaker emulation that winds up and down in speed pretty much like the real thing, with user-adjustable speed, speed-change rate and depth. As expected, the reverb section includes a spring simulation, without which no guitar effects box would be complete, but there are also plate and room options if you prefer. The rotary controls adjust the high and low damping, as well as the wet/dry mix. When you add up all the amp models, speaker models, pedal models and post-amp effects, you have a package capable of exploring just about any genre of guitar sound. All that remains then is to offer some opinions on how the unit actually sounds. Four different effects are available simultaneously, although parameters for all of them are accessed through the same set of three knobs at the right. When I first checked out the presets using both a Strat and a Les Paul, I got the impression that they were slightly over-bright, but a little editing definitely helped. After some of the other modelling preamps, the Tone Lab seems slightly strange at first, until you realise that it's because it behaves more like a real amp and doesn't have the same instant-gratification, mega-produced sounds that some modelling units try to deliver. Not that you can't dial in some compression, delay and reverb to get a very produced sound if that's what you're after, but if you strip all that away and listen to the amp models, they have a welcome degree of reality and musicality about them. They certainly capture the elusive feel and dynamic response of a real amp, and if at some settings the sound seems a little gritty and edgy, that's probably because a real amp would too under the same conditions! After a little tweaking, I was soon able to get most of the right sounds, or at least sounds I perceived to be right, given that guitar sounds are such subjective things. Doing a direct comparison with my Pod XT, I found that the sound had more ring to it and more definition at the starts of notes. The sounds I've always found hard to replicate are those powerful but almost clean sounds, with a hint of compression, or those dirty '60s R&B chords (I use R&B in its original and correct context here!). I have to say that the Tone Lab really excels in this area, and while I found it marginally easier to get the types of overdriven sounds I liked from my Pod XT, the Tone Lab was a clear winner when it came to country guitars, clean Floyd sounds, Dire Straits-like tones, vintage Stones — or just plain old rhythm guitar. It was almost as though the guitar itself had more life and that the tonality was enhanced by the preamp rather than being buried by it. Interestingly, one of the nicest quasi-clean sounds I got was by using the Recto amp model (with the gain backed right off) teamed with a British 4x12 cab, compressed just a hint — very 'All Along The Watchtower'! When it comes to dirtier sounds, it's hard to choose, because one unit might win out in some areas, while its rivals pull ahead in others. I think it fair to say that the Tone Lab is more amp-like, though, and its sounds cut through better, even though the Pod XT makes it easier to recreate many of the overdrive sounds you hear on records. It's all a bit unsettling, because I really like my Pod XT, but during the course of this review I got some great touch-responsive sounds using the Tone Lab that I couldn't quite match any other way. I said earlier that guitar sounds are subjective, and of course they are, but if realism is what you're after then the Vox Tone Lab is extremely good, and manages to preserve the life and jangle of the instrument at low volumes and drive levels. All the classic sounds are in there, from crystal clean to shred overdrive, with all the subtle nuances in between, but be prepared to edit the presets, because they sound very different with every guitar and many of them were initially too abrasive for my taste. 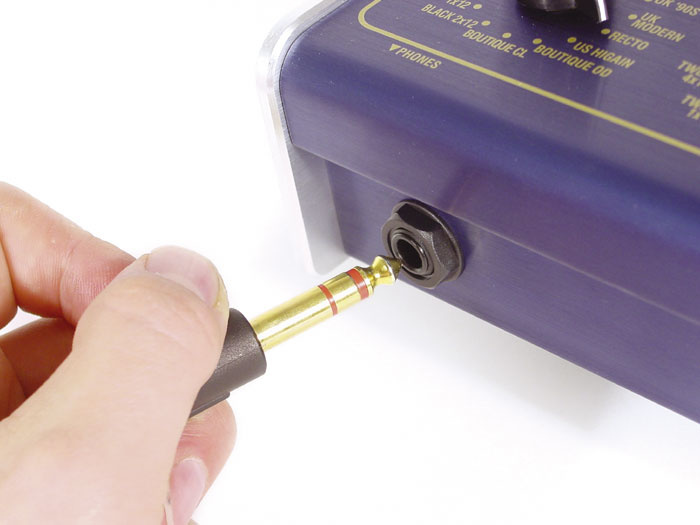 Also explore the relationships between preamp gain and power-amp gain (the VR Gain knob), as this is the secret to getting the sounds just right. If there's a weakness, it is that you have to work hard to get heavy overdrive sounds that cut through without having too much fizzy edge, but the half-and-half sounds are excellent. Having said that, I found I needed to add a lot of bass to most sounds, and there wasn't as much low end 'chunk' as I'd expected given the description of the onboard valve circuitry. In addition to the amp modelling, the effects are very strong, especially the multitap delays and the compressor. In some ways it would have been useful to have the compressor effect always available, rather than it being only one of the available pedal choices. As you can probably tell, I like the Tone Lab very much for those things it does very well, and I don't think there's anything it actually does badly, though for me it's best at 'on the edge' and 'not quite clean' sounds. Naturally you shouldn't take my word for it, because one man's perfect guitar sound is somebody else's angle grinder, but if you're hankering for a DI solution that comes close to the sound of a real amplifier, you owe it to yourself to check this unit out before making up your mind. You may have to work on those presets a bit, but it's well worth the effort. Excellent clean and lightly distorted sounds with lots of life and jangle. Heavily overdriven sounds can sound gritty. Compressor is an either/or choice, but it's so good that it should be available all the time. An interesting approach to guitar modelling that sounds quite different to its rivals. It beats most of the competitors hands down for authentic clean and mildly dirty sounds, but you have to work to achieve heavy rock overdrive that cuts through without tending towards edginess. If you're into US-style overdrive, this won't worry you, but some UK rock sounds can be tricky to achieve. Korg UK Brochure Line +44 (0)1908 857130.